Hire Awards of Excellence 2019 Categories. Timings for the Hire Awards of Excellence on Saturday 13th April 2019. 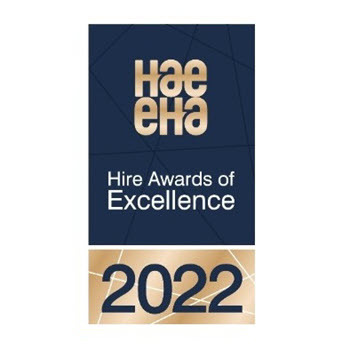 In 2019 the Hire Awards of Excellence returns to the Grosvenor House Hotel, the event was last held here in 2018. This luxurious venue has undertaken some significant refurbishment since then, offering a central London location and stunning views of Hyde Park. Accommodation is available at the Grosvenor House Hotel, click here for more information and to book alternatively contact the team on 44 (0)121 380 4622 or awards@hae.org.uk. Hire Awards of Excellence Sponsors can essentially custom-create a unique package, anything from simple branding on your dinner table right up to trophy presentation or filmed interviews. We've developed some packages as outlined below however to discuss something entirely bespoke to suit your needs please contact the team on 44 (0)121 380 4605 or awards@hae.org.uk. Browse through a selection of images from the 2019 Hire Awards of Excellence. Click here to view the various packages and find out how to become a sponsor of the Hire Awards of Excellence. For further information, please contact the team on 44 (0) 121 380 4605 or email awards@hae.org.uk.